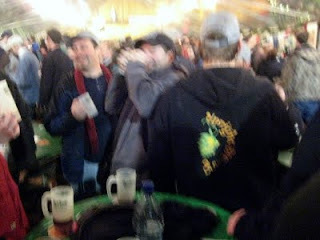 Yesterday's session of the Portland Holiday Ale Festival sure got crowded fast. When I got there about 3 with Dave and my Austin visitors Bill and Lance, the line for vintages of Hair of the Dog Jim was already backed up all the way out of the upper tent, down the stairs, and into the main tent. Lines for most other beers were quite manageable well into the evening, once you realized that most of the people in the chutes were just standing around chatting and not really waiting in line. The festival reports first-day attendance of over 2500 people -- you can imagine how crowded and loud the tents at Pioneer Square were. Don't drive there. These beers are huge, and they'll catch up with you. Take the bus or train, or arrange a ride home. Bring water. If there were mug rinse stations, I didn't see them. You can buy bottled water, but why not just come prepared? Get there early. Shorter lines, less shouting. Warm up your beer. Due to storage and weather, the beer is served too cold to get the best flavors. Cup it in your hands for a while before tasting. Samples, not full pours. Because they're cheaper, easier to warm up, and won't clobber you as quickly. No kids allowed whatsoever. Dave found out the hard way that even a baby in a backpack is verboten. Because of the strength and deliciousness of the beer at this festival, it's easy to go a little overboard. Food, water, and pacing will help you out with that. Just don't count on driving home. I don't even think I would recommend biking to this festival; for one thing, there's not much in the way of bike parking. Those Baltic Porters from Hopworks and Laurelwood are wonderful, but I think both are available in the pubs right now, so you might not want to spend your festival tickets on them. The sour Sang Noir is a unique blend that won't be seen again: it's a good choice when you need a change of palate from the big dark beers. Just make sure and warm it up: there's a dusty note to the beer that doesn't go down well when it's cold, but that adds just the right funk once the beer has warmed enough. That hardly does justice to the many offerings at the festival, but these were standouts among the few beers I tried yesterday. Leave a comment if you have something to recommend. Picture title: "A view of the fest from the drinker's perspective, four hours in." It was good meeting you yesterday. Sorry if I seemed in a hurry, I was trying to get back to Eugene in case it started to ice up last night. Jeff: I had a crisper picture, but this one looks more like my memories of the festival. Kevin: no worries, thanks for the tickets. We're swimming in the same pond now, I'm sure we'll meet again.